With Bridget, the Borden’s Irish maid doing all of the heavy laundry duties down in the cellar: heating water up in the cauldron, washing clothes on a zinc washboard, pressing water out through a mangle, and lifting heavy baskets to the clothes line under the pear trees on Monday and Tuesday, Lizzie only had to press her fine hankies on Thursday morning. Even this small task seemed to take an unusually long amount of time, if one believes Lizzie about when she said she commenced to iron, when her “flats” got cold, and if the fire had really gone out in the kitchen woodstove so the flats could not be reheated. 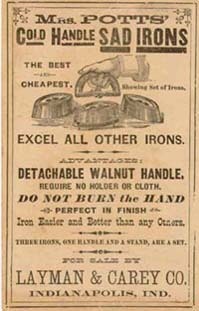 Electric irons had been invented in 1880 but were dangerous to use, as they were not grounded. Just imagine if Lizzie had had electricity and one of those new irons! Her story about going out to the barn to look for metal for fishing sinkers was prompted by the fact her irons had gone cold. While she was out there, the villain managed to sneak in and commit the homicide of her father. Was the “cold iron” a more important clue than is generally thought? Lizzie had to fabricate a reason for going outside to the barn, and not only came up with the looking for a bit of tin or “tea lead” but also embellished the alibi with a great deal of pear-eating, turning over boards, etc. 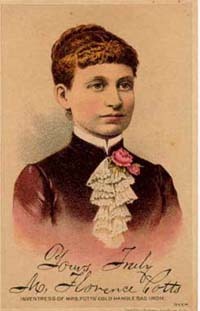 Still she managed to appear “Immaculate-as if she had just washed her hands” to neighbor Addie Churchill minutes later after Lizzie re-entered the house and found her father dead on the sofa. One wonders what the story might have been if one believes Lizzie was innocent and her flats had not gone cold. She would have been still ironing in the line of sight of a homicidal maniac, 6 feet away from the head of the sofa where Andrew’s head would soon be pulverized with a sharp blade. Lizzie’s own body may have been found by Bridget a few minutes later (when the maid came back downstairs from the third floor), stretched out on the dining room floor. Flat irons, sometimes called sadirons (a contraction of solid iron) must have been tediously heavy and unwieldy to use. They might make a great blunt instrument, but could not have made the sharp-edged cuts upon the heads of either victim.